If you're a developer or system administrator lured to Mac OS X because of its Unix roots, you'll quickly discover that performing Unix tasks on a Mac is different than what you're accustomed to. Mac OS X for Unix Geeks serves as a bridge between Apple's Darwin OS and the more traditional Unix systems. This clear, concise guide gives you a tour of Mac OS X's Unix shell in both Leopard and Tiger, a… nd helps you find the facilities that replace or correspond to standard Unix utilities.You'll learn how to perform common Unix tasks in Mac OS X, such as using Directory Services instead of the standard Unix /etc/passwd and /etc/group, and you'll be able to compile code, link to libraries, and port Unix software using either Leopard and Tiger. This book teaches you to:Navigate the Terminal and understand how it differs from an xtermUse Open Directory (LDAP) and NetInfo as well as Directory ServicesCompile your code with GCC 4Port Unix programs to Mac OS X with FinkUse MacPorts to install free/open source softwareSearch through metadata with Spotlight's command-line utilitiesBuild the Darwin kernelAnd there's much more. 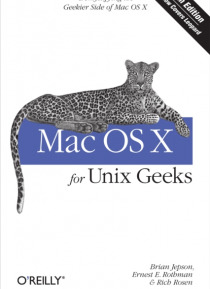 Mac OS X for Unix Geeks is the ideal survival guide to tame the Unix side of Leopard and Tiger. If you're a Unix geek with an interest in Mac OS X, you'll soon find that this book is invaluable.